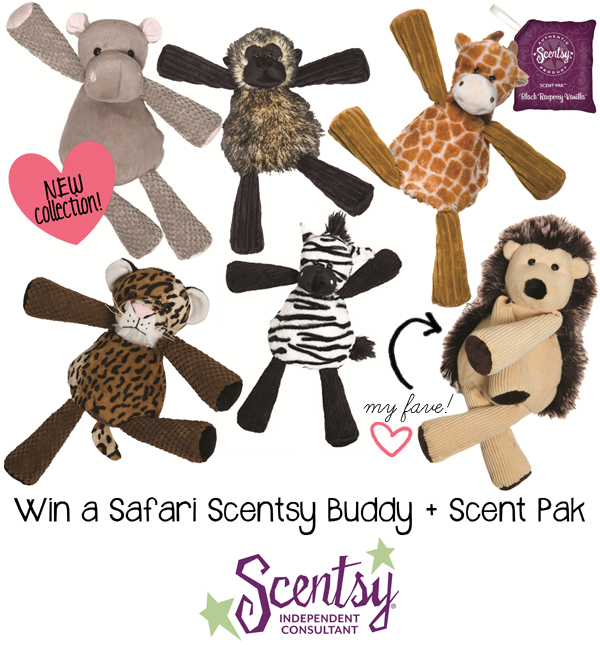 The second giveaway this week is for one Safari Scentsy Buddy and Scent Pak! These are super cute and I can't wait to get one for Benjamin! Ashley Lee is a new friend of mine (and my new Scentsy Consultant!) via Instagram. She lives just 40 minutes away so I'm looking forward to play dates and Scentsy parties in the future! She blogs here. Check out the Scentsy catalog on her website. "Join us on a Scentsy safari adventure! Introducing the newest, cuddliest friends around–the Scentsy Buddy Safari Collection–in a new size, just perfect for snuggling. Our original Scentsy Buddies have retired to make way for this limited-edition group of fuzzy friends, inspired by the amazing wildlife of Africa. These buddies will return to the wild soon–but don’t worry, we’ll have a new bunch of pals for you next year! View more fun, new Scentsy Spring Summer product in the new 2013 Scentsy Catalog. Each Scentsy Buddy is approximately 8” tall when seated and approximately 12” tall from head to toe." PLEASE NOTE THAT I ADDED ONE MORE WAY TO EARN ENTRIES IN YESTERDAY'S GIVEAWAY! My favorite Scentsy Buddy is the giraffe. The hedgie is just too cute!!! And please have a scentsy party soon; I'd love to order some new scents and another warmer for the Spring! I LOVE The HedgeHog.. He would be friends with the Hedgie that lives in my car :) Rafflecopter is not working for me right now. I will have to come back.. I guess. How do you choose a favorite? They are all so cute. I like the Hedgehog, but I also love the Monkey and the Giraffe.